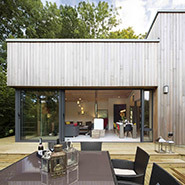 Vastern Timber is proud to offer the Brimstone range of thermally modified British hardwoods. Sourced exclusively from English and Welsh woodlands, Brimstone products are ideal for cladding, decking, external joinery and outdoor furniture. The Brimstone range is a great fit for Vastern Timber as the company continues to promote British grown timber in to the construction, joinery and furniture markets. The Brimstone range includes thermally modified ash, sycamore and poplar. While Brimstone products incorporate all the benefits of locally grown natural timber, the modification process dramatically improves the performance of the timber. We are excited about the Brimstone range because it offers an attractive and reliable alternative to tropical hardwoods using wood sourced from native woodlands. We believe that the Brimstone range represents a real opportunity to improve the management of our mixed woodlands by creating a demand for lesser-used white hardwoods. Thermally modified (TMW or TMT for short) is the produced by super heating timber to temperatures of between 160° and 210°. There are various processes, but the end goal remains extreme heat without the wood catching fire! The thermal modification process does not involve any chemicals and penetrates to the core of the timber. The combination of high heat and steam reconfigures the wood in a number of interesting ways. Firstly sugars and resins are cooked out of the wood, leaving nothing for the fungus and bacteria to feed on. Secondly the components in wood that hold on to water are converted into those that do so less. Thirdly the process turns all woods a beautiful walnut colour. One of the most impressive outcomes of thermal modification is improved stability. Thermally modified timbers have a stable moisture content of approximately 2 – 4%, even when left outside in wet conditions. This means that, wet or dry, hot or cold, the amount of shrinkage and expansion in the modified wood will be negligible. The second key advantage of super-heating wood is that it converts wood species that would normally rot when left outside (non-durable) into products that will last for many decades untreated. Research has shown that thermally modified white hardwoods reach class 2 durability and for some species class 1 (EN350)*. Class 2 indicates a service life of 30 years for thermally hardwood products used in above ground applications. Like other thermally modified timbers, Brimstone products are all an attractive deep brown colour, similar to that of walnut wood. Unlike many natural wood species however the colour is relatively consistent and as such it weathers evenly when used untreated outside. Unlike thermally modified softwoods such as Thermowood®, the products in the Brimstone range contain relatively few knots, resulting in a clean and contemporary appearance. Thermally modified wood is available from many parts of the world, but what sets the Brimstone range apart, is that it is produced from trees grown in English and Welsh woodlands. Brimstone products have been born out of a desire, to not only offer sustainable wood, but to ensure that in doing so we are sustaining our local woodlands first. Over 60% of mixed woodlands in Britain remain undermanaged resulting in poor habitats for plants, animals and us. Brimstone truly offers an opportunity to make a meaningful difference to our local woodland economy. 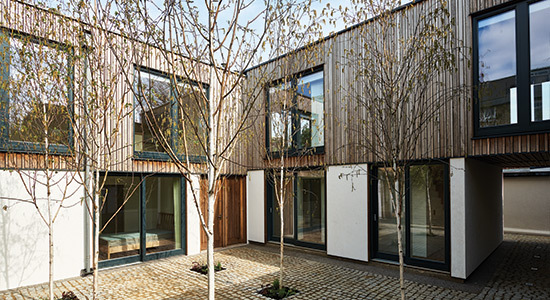 In our view modified woods are the future and in many ways thermally modified timber is superior to natural timber. However the super heating process does result in a loss of bending strength, which renders Brimstone products unsuitable for some structural applications. This characteristic should be taken into account when deciding whether or not to specify Brimstone. Call us for advice on the suitability of Brimstone for specific projects. The Brimstone range currently comprises three products.